LP SOLIDSTART RIM BOARD | International Wood Products, LLC. LP® SolidStart® Rim Board delivers superior performance in a wide range of sizes and depths. IWP offers Rim Board in both OSB and LSL substrates. 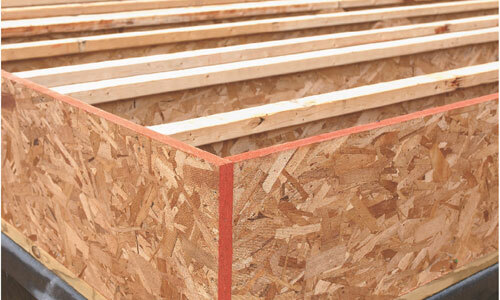 The OSB substrate is manufactured with thermal-set, waterproof adhesives and wood strands which are bonded, cross-directionally layered, and then pressed under extreme heat and pressure. The LSL Rim is made from a mix of aspen and maple hardwoods bonded together with a waterproof adhesive in a steam injection press. Reliability: High strength and low shrinkage. Efficiency: Precision-cut to match depths of LP SolidStart I-Joists, eliminates need for field ripping, and creates flat surfaces for easy installation of siding. Peace of Mind: Approved for one-hour and two-hour fire-rated rim board assemblies for party and exterior walls. Strength: High lateral load capacity for seismic and high wind applications. High vertical load capacity and low shrinkage for mid-rise construction. Sustainability: Wood sourced through programs certified under the Sustainable Forestry Initiative®. Lifetime Limited Warranty: Backed by a long-term warranty you won’t find with traditional lumber. See complete warranty details for more information.